Gamers have always held Gainward in high regard because they openly embrace the overclocking community, and provide software such as "EXPERTools" which can overclock the card with the push of a button. Supporting overclocking in this way gives Gainward a little more control over what settings are used, so hopefully less cards will be fried in the process. One pet peeve I have with the Gainward GeForce 4 PowerPack GS Ultra/750XP surrounds it's somewhat confusing name which is really too long. With so many different varieties of GeForce 4 videocards out there - from the GeForce 4 MX420 to the GeForce 4 Titanium line - one can often get lost in the sea of nomenclature. For example, what does 750XP really stand for? Does it imply that the memory can run up to 750MHz, or that at stock speeds it chugs away at that speed? I think Gainward should just remove this title and shorten down the name; especially considering that I've heard a few accounts of uninformed consumers who bought the card with the belief that it was somehow a "handpicked Golden Sample" that was faster than other Ti4600's. After removing the Gainward GeForce 4 PowerPack GS Ultra/750XP from its packaging the first thing you are struck with is just how long the thing is. The videocard measures 23.5cm long which is almost as wide as our 8K3A+ testing motherboard (and no it didn't interfere with any capacitors). 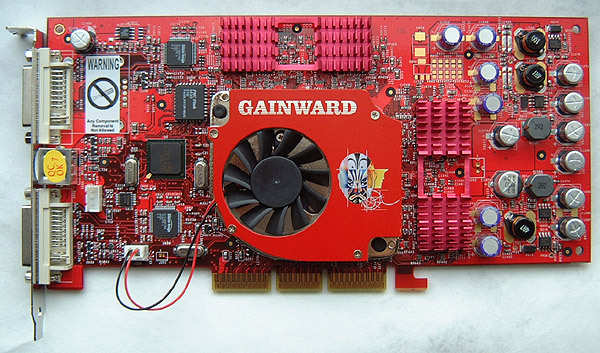 Like most other manufacturers, Gainward have chosen to go with the nVidia reference card design. Comparing against our nVidia GF4 they only difference is the colour of the PCB, and the modified the GPU cooler faceplate and funky ramsinks (front and back). 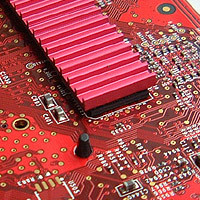 By the way, there is a good chance of pulling off the BGA memory if you attempt to remove those ramsinks, so just leave them put! The dual DVI ports come in handy if you are lucky enough to have twin LCD's, and channel will support resolutions of upto 2048x1536 pixels. The GS Ultra/750XP is the only Ti4600 at the moment which comes with two DVI video ports. If you want to use two monitors with analog connectors that is not a problem however. Gainward have taken the liberty of including two DVI to 15-pin analog converters along with the GS Ultra/750XP. 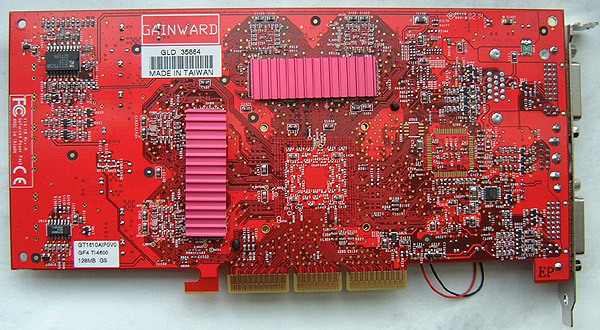 The other peripheral Gainward has included in the package, in a bid to set itself apart, is a four port Firewire (IEEE 1394) PCI card. Considering that most Firewire add-on cards cost about $75 CDN, this is a cool value, but probably one that factors into Gainward's higher than average price point. 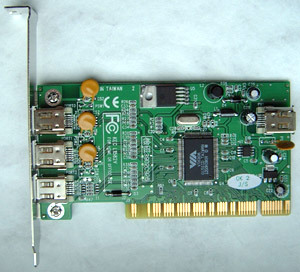 The Gainward Ultra/750XP uses the Phillips 7108E chipset to handles the VideoIn - VideoOut capabilities on the card (an adaptor cable is included as well). Rounding out the other goodies in the box are exactly one semi-old game and the follow productive software titles; WinDVD, WinProducer, and Wincoder. While Serious Sam is a fun game it is a little disappointing that Gainward didn't include any other additional titles.